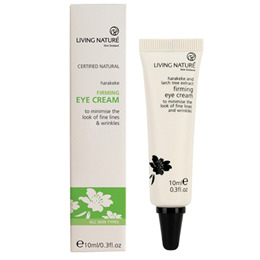 Living Nature Firming Eye Cream contains nourishing active manuka honey and hydrating harakeke flax gel. The Firming Eye Cream is highly concentrated and easily absorbed, to help reverse the ageing effects of stress and wear around your eyes. A natural humectant, the unique manuka honey nourishes the delicate tissue to promote cell regeneration, and its natural antimicrobial properties protect against bacteria, for brighter, healthier skin. Harakeke flax gel plumps out fine lines for a smoother, fresher look and its soothing and cooling properties help reduce redness and puffiness. Its gentle astringency tightens pores and helps lift the skin. Larch tree extract then locks in moisture to keep your eyes bright and radiant throughout the day. The Firming Eye Cream is suitable for all skin types. Aqua (water), Cetearyl olivate, Sorbitan olivate, Caprylic/Capric triglyceride, Glycerin (vegetable glycerin), Limnanthes alba (meadowfoam) seed oil, Simmondsia chinensis (jojoba) seed oil**, Squalane (vegetable squalane), Glucose, Sclerotium gum, Caryocar brasiliense (pequi) fruit oil, Daucus carota (carrot) extract, Galactoarabinan (larch tree gum), Mel (manuka honey), Phormium tenax leaf juice (NZ flax gel), Glucose oxidase, Lactoperoxidase, Tocopherol (vitamin E). **Certified organic. Each morning and evening with your ring finger, gently pat a small amount onto the skin around the eyes. Avoid rubbing, or applying close to eyelashes. Below are reviews of Living Nature Firming Eye Cream - Harakeke - 10ml by bodykind customers. If you have tried this product we'd love to hear what you think so please leave a review.